It has been pretty hot here in the first days of summer and not at all pleasant for slaving over a hot stove. I’ve eaten fruit at breakfast, salad for lunch and when dinner came around I really felt like something a little bit more substantial, that didn’t take any effort to prepare. It needed to be simple, and it needed to be from ingredients that I had to hand. I have just harvested my garlic for the season, there was a chilli in the fruit bowl and plenty of parsley in the garden. This is one of the best simple dishes I know. It is quick to make and the final result is much, much more than the sum of its parts. Cook the spaghetti in plenty of salted water. When the spaghetti is almost done (about 3 mins before) add the oil to a frying pan, add the garlic and chilli and fry until the garlic is just starting to colour. Do not burn it. Add a half a cup of the pasta cooking water to the frying pan and remove from the heat. When the spaghetti is cooked, drain (reserve some of the water), add the spaghetti back to the frying pan and toss with the garlic and chilli over medium heat. Add a little more oil and water if needed. The water and oil should emulsify and coat the pasta. It shouldn't be dry, but slippery. You can add more water than you think because the pasta will absorb it. Throw in the parsley and season with salt and pepper to taste. If you want you can garnish with some vegan parmesan. I used Vegusto Piquant. This recipe is so simple it relies utterly on the ingredients. 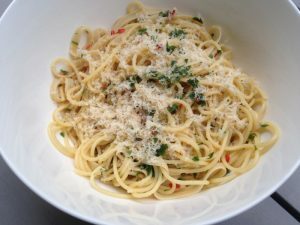 Use good pasta, fresh garlic and fresh chilli and it is hard to go wrong. Yes the Vegusto piquant cheese is good. It makes a great parmesan substitute. It is one of my favourite cheeses. The dish is still delicious without it though. But if you haven’t tried it I recommend it.